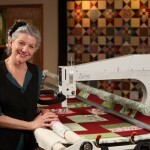 Rising in popularity at the moment, the long arm quilting machines trend looks set to continue. Designed so you can complete fabulous quilts more easily, they can save you LOTS of time. You’ll be able to produce more quality quilts in a shorter space of time with a long arm machine. As opposed to a regular quilting machine a long arm machine will allow pieces up to 18 inches on a side. The long arm quilting table can be 10 to 14 feet wide making it easy to create a very large quilt. Long stitches and large patterns become simple when the piece is being sewn. It’s the machine that moves, the fabric remains in one place. You do need a dedicated space to set up one of these machines; they are not fold up and put away items! 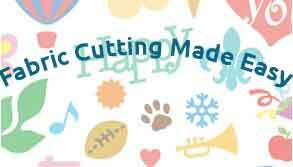 There are a variety of long arm quilting machines available to choose from today with a whole list of features which can sometimes be interchangeable between models. 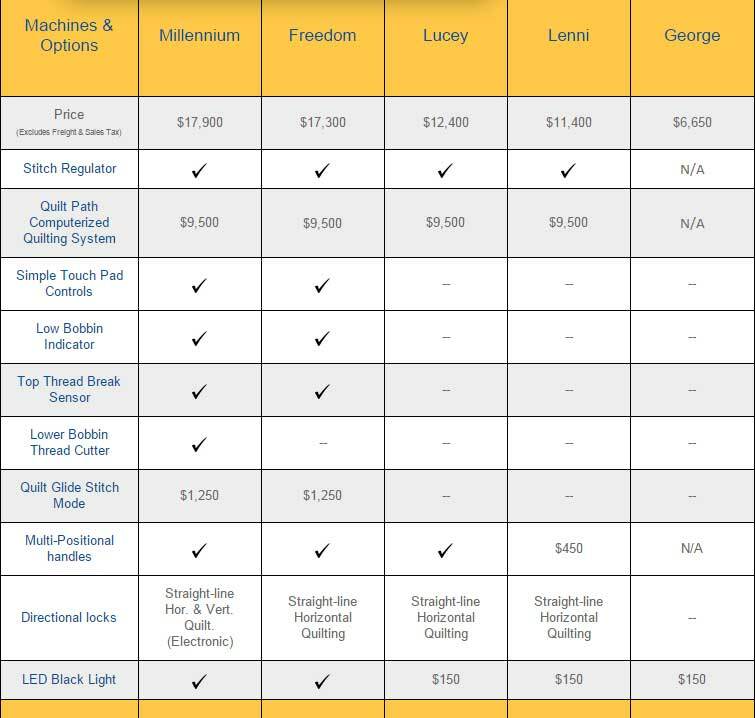 The price is determined by the list of features so your budget will decide which quilting machine you buy. Purchasing a long arm quilting machine is a big investment so make sure you do your research and get the best for your budget. Here you can see an explanation of how a long arm quilting machine works and get an idea of the amount of room you’ll need for one. There are many makers of long arm quilting machines; below I’ve listed the more well-known ones. 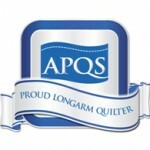 APQS long arm quilting machines –They do 5 models ranging from $6,650 to $17,900,. They come with a lifetime warranty and a setup and delivery service. Made completely in the USA by a 30+ yr old company who have a reputation for quality these machines would be my first choice. 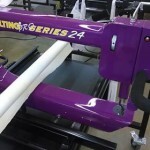 Nolting long arm quilting machines – another company based in the US; Nolting Quilting Machines were the first to produce the longarm quilting machine. Nolting manufacture their own machines: ” We do the sawing, bending, milling, welding, lathe work and drilling of every machine and frame. We also do the assembly. Our assemblers take a finished longarm machine body and assemble it completely. They install everything from the electrical and electronics to the gears and shafts to the sewing components to the decals and the unique serial number plate.” Nolting have a wide range of options and prices available. 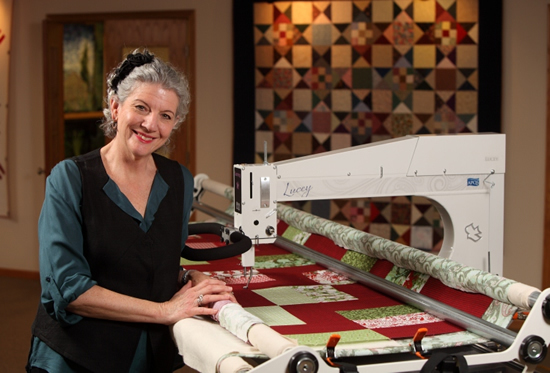 Handi Quilter long arm quilting machines – “Designed by a Quilter, for Quilters”®, Laurel Barrus the founder of the Handi Quilter wanted a portable frame. This is another company who manufacture and produce in the US and are well known for their high quality machines. Gammill long arm quilting machines – Celebrating 25yrs of being in business Gammill works in conjunction with Statler who design the computer side of Gammill quilting machines. They have a number of options available starting with the basic machine system without the Statler system; this can easily be upgraded at a later date. Tin Lizzie long arm quilting machines – The company started in 1948 manufacturing sewing machines and in 2005 their long arm quilting machines went into production. It comes in four different models and the “Quilt Magician” handles the computerized side giving a huge selection of patterns and designs. Husqvarna long arm quilting machines – Husqvarna have been around for a long time and have gone from being an arms manufacturer in 1689 to making sewing machines 2 centuries later! They are better known for their domestic sewing machines but now make the PLATINUM™ 3000 long arm quilting machine. Grace – Better known for their quilting frames the Grace company have produced the Qnique Quilter. Not strictly a long arm quilter but a mid arm quilting machine designed for the home hobbyist. This is just a brief foray into the world of long arm quilting machines which have added a new dimension to the world of quilting. These machines are now making it much easier if you want to turn your quilt making into a viable business. I’ll be doing reviews on individual machines; but for now based on price, features, warranty and customer service the APQS company is my top choice. You can find out more about them and make a purchase over at Fons Porter . Wow! I didn’t even know such machines existed. I can’t wait to see all of your reviews. Thanks for the information. Great website, very informative. My Mother has been quilting for a long time! Thanks for stopping by and leaving a comment Steve. Quilting is a great hobby, useful too! The long arm quilting machine is truly an eye-opener. If my grandma was still around, she would have love to work with one of these. She spent years hunching over smaller sewing machine which could only do so much for her artwork.